Most templates have tables with measurements that are prepopulated from equipment if the equipment supports structured reporting. The measurements that come over from the equipment are highlighted in green color and the ones that are modified by the user are highlighted in blue. If there are no measurements in the table, the SR data was not received from the equipment. Depending on the template, it may have some prepopulated findings/conclusions according to the measurements. Some templates are fully manual; then the findings have to be entered manually. If the checkbox in the “eye” column is selected, this part of the text will go to the findings section. If the checkbox under the “report” icon is selected, this part of the text will go to the conclusion. If both of the checkboxes are selected, the text will go in both the findings and the conclusion sections. This button allows you to select findings from the list of findings. To add a free text, please use the plus button at the end of each section. After the report is filled out and ready to be finalized, click I confirm this report in the bottom left corner of the screen and then click Finalize and send in the bottom right corner of the screen. The report will be attached to the patient’s record. 1. Clear – reverts all changes to the original values as if the template was opened for the first time. 2. Reset – resets all changes to the draft version or to the original values as if the report was opened for the first time. 3. Preview – creates a preview of the final report in the PDF format. 4. Save as draft – saves the report with all the changes and selections as a draft version. 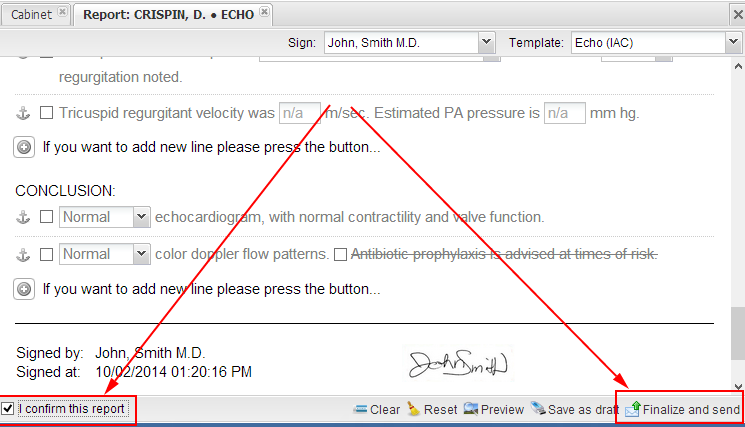 If a study was read, it is possible to add an addendum report which can be signed by another doctor. The “addendum” option is available for every study including those with finalized reports (using this option on those studies will result in moving the existing reports to the archive). Drag and drop your report file onto the window or browse for it. The supported formats are DOCX and PDF. Then click Upload.